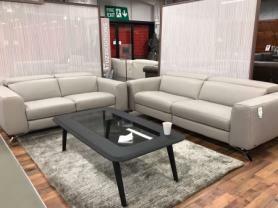 Oslo beautiful thick leather off the floor sofa which is a mixture of modern and classic living. Thick protecta family friendly leather all over the sofa. Pocket sprung seating which is very comfortable and high backs for that support. 3 Seater L: 229 cm. 2 Seater L: 163 cm. Depth: 93 cm.